Yay, I’m 30! My birthday itself wasn’t too special. My husband had to work, so he came by to take me home on Monday evening. First, we stopped by the “electric kettle shop”, ie. the electronics store, to get me an electric kettle. We had one already, but you couldn’t take off the kettle so had to fill the whole thing while it’s in the power socket. I also didn’t like its size. My husband bought me a 0.8l kettle. I loved the week-end before my birthday, however. My sister and her boyfriend came by on Saturday. They gave me a shower gel, shampoo and pure lanolin. 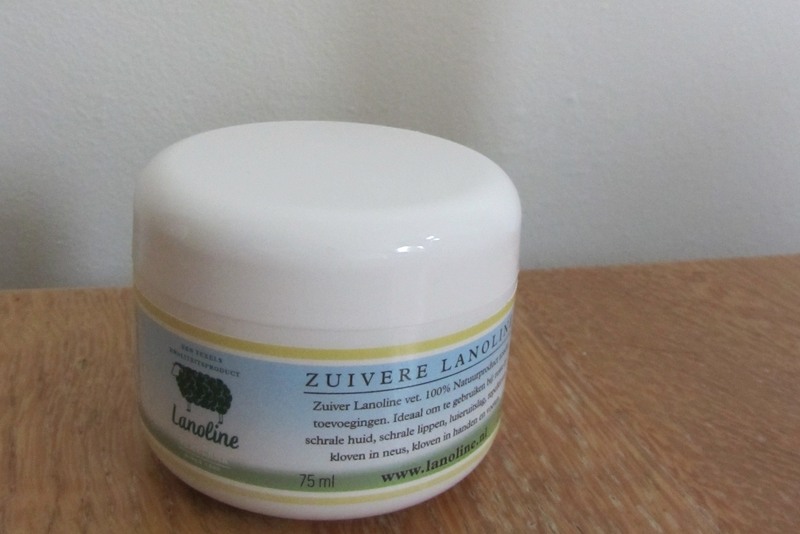 Lanolin is used in creams and lotions as an emulsifier. They didn’t know when they bought these gifts that I plan on making my own body creams and lotions, so it was a wonderful coincidence. The best gift I got for my birthday was however a gift I gave myself: a starter kit for making your own melt and pour soap. Melt and pour soap is made by cutting pure soap into small chucnks and melting them in the microwave or au bain-marie in a soap kettle or pan. I made my first soaps at day activities and we renamed one of the smaller pans the soap pan, because you’ll never get the soap taste out of it once you’ve used a pan for soaping. My art therapist, who also works at day activities but not that particular day, hoped it wasn’t the milk pan. I think it was. Once the soap is melted, you pour it into a measuring cup and add colorant and scent. 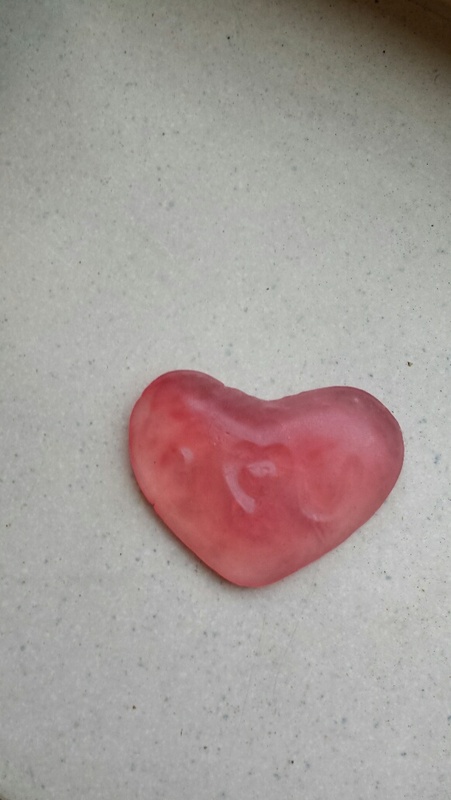 For my first soap, I used red colorant and coconut scent. You stir to make the colorant and scent blend with the soap. Then you pour the soap into a mold. I had a bit too little soap to fill the mold, so my first soap is a bit thin. I chose the heart shape to give to my husband. Now that I’ve made some other, more well-formed soaps, I’m getting queries from everyone asking me to make a soap for them. Most so far don’t want anything I haven’t tried yet, but one woman wants a pink one. That will be a challenge. I’ve already made a green one by mixing blue and yellow colorant, but am not too sure how I’ll make pink with just red, yellow and blue colorants. I don’t know what type of colorant is used in the starter kit, so I can’t buy new colorant and see whether they have a pink one yet. I also just today bought myself some tools and materials for making lotions. You make a lotion by melting lanolin and a plant-based oil, such as sweet almond oil, making sure they’re well-blended. This is the oily component. Once it’s melted, you need to add the water component, which consists of distilled water, herbal tea or a hydrosol (floral water). You can also add aloe vera juice to the water component. You need to add the water component drop by drop while constantly stirring. Then, let the lotion cool off to at most 30 degrees Celsius before adding essetial oil or fragrance oil. My husband thougth that essential oils are skin irritants, because the packaging said so, and so you cannot add them to lotions even when diluted. I have yet to ask whether this is true in one of the safe essential oil use groups on Facebook, since I’m pretty sure that, if diluted to at max 3%, you should be safe. This is getting old, but I have been extremely uninspired lately. It’s like everytime I try to do blogging in Dutch again, I neglect this blog. It wasn’t even so much that I didn’t want to write, but I didn’t kow what to write about. A few days ago, however, I saw a blog post in which a person wrote a thank you letter to their genetic counselor. Other people were invited to write thank you letters to people you wouldn’t expect they’d be thankful for. This got me thinking. At first, I wanted to write a thank you letter to the psychiatrist who admitted me to hospital in 2007. While writing this letter, however, I thought of another person who was important to me that night: the bus driver who overheard me make a suicidal threat and called the police. I am writing a letter to him today. You may have forgotten about me. At least, I hope you have. Thhat’d mean you didn’t experience too much stress from what I did while on your bus. I haven’t forgotten about you. I don’t know your name, but I want to thank you anyway. I was the person who threatened to kill herself while sitting on your bus on the evening of November 2, 2007. I told someone’s voicemail the details of my suicide plan. You overheard me, although a fellow passenger said you merely heard me cry. She probably just said that to quiet my mind. I heard you tell the police that you would be at the train station by 8:15 PM. By that, I judged I’d got onto the 8:01 bus at the bus stop near the training home I used to reside in. You dropped me off at the train station and the police took over and took me to the police station, where I was seen by the mental health crisis service. I want you to know that I’m well now. I’m not fully recovered from my mental illness, but I’m a lot better than I was back then. I remembered you for years, which was causing me to find it hard to travel the bus in your city. I feared I’d run into you. Now, I know that you did your job and you did it well. I could bore you with a long story of my mental illness and recovery, but that would probably stress you out. In case you’re wondering, however, I want you to be assured that I’m happy that I didn’t kill myself that evening. Now I know that, somewhere between the bus and where I wanted to kill myself, someone probably would’ve stepped in before I would actually be dead. However, you happened to be that person to step in. Thank you for that. It’s (almost) summertime. The weather has been quite good here lately. Particularly last week, the weather was lovely. This week, it’s getting slightly cooler and we’ve had some rain. However, the weather is still good enough to be outside in a T-shirt without a jacket. That’s one thing I love about spring and summer. One of Mama’s Losin’ It’s prompts for this week is to share your top ten summer plans. I am really looking forward to this summer and I’d love to share my plans with you. Many are the same as last year’s, but unlike then, I did already make some of my plans happen. Go swimming. This is one of the items on last year’s bucke tlist that I couldn’t cross off then. This year, I’m participatng in a four-day swimming event this very week. I’m swimming only 100 meters each day, which is the shortest distance you could do. So far, I’ve completed two days of the event, that is really five days, already. You only need to complete four out of five days for the medal, but I plan on swimming each day. Have a barbecue. This is on last year’s list too. I didn’t think that I’d make this year’s barbecue on the institution unit, but now I think I will. It hasn’t been planned yet, but I heard the head nurse say she was going to get the DJ we have each year booked again. Sit in the garden. My home garden this time. I didn’t know last year of course that this year I’d have a real garden at home. The unit garden is also going to get remodeled soon. Eat strawberries, blackberries, blackcurrants, etc. I got raspberries from the market last week, but we don’t have them in the garden. The shrub my husband bought died before we could plant it. We do have many other berries, however. I don’t know how well they’ll do their first year, but I already ate a strawberry out of our garden last week. Go for walks. I walked form our old apartment to the institution a few times last year. This year, our walks have been in the tiny village. I hope to go to the woods sometime this summer too. Spend time with family. I’ve got to have an item on the list that I didn’t have last year. My sister and my parents are both coming over to our home next week (if my sister can get the day off) to celebrate my birthday. Eat the head nurse’s French fries and/or macaroni. There’s a nurse who lives in Turkey most of the year who comes over to work at our unit for the summers. It’s a tradition that she and the head nurse make macaroni from scratch once each year. It doesn’t sound that special, I know, but for people who normally get microwave meals everyday, it is. I’ve also heard the head nurse has plans for making us French fries on a Sunday in July. She makes fries about once a month, but usually on Saturdays, when I’m home. Wear my new dress. I already wore a skirt several times this year. I also bought two new dresses, one of which I already wore. I want to wear the other one too. Do lots of reading. This was one of the things I didn’t do enough of last year, even though I could. This year, it’s even easier, since I finally got a full Bookshare membership. I plan on reading a few books that I’ve wanted to read forever but never got down to buying as eBooks. Not that I couldn’t have bought them as eBooks, but I was planning on getting a Bookshare membership all along and so delayed getting the books. Reading books in DAISY format is still easier than reading eBooks. Of course, getting them from Bookshare, which is like a library for print disabled people, is cheaper too. I will review the books that I read here too. Write. I haven’t been blogging here as much as I’d like to this month or last month. After all, I’ve been feeling pretty uninspired. I hope to be inspired soon.